Groups are created and managed in the Group tab of the Control Panel. 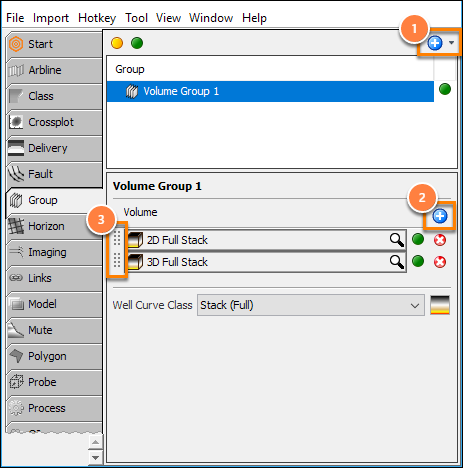 Use groups to display multiple volumes simultaneously or as part of special blending operations (e.g. RGB blending). When a group is selected for viewing, the volumes in the group are displayed in the order that they appear in the group. At the tab header, click the blue "+" icon. In the Details Panel, click the blue (+) to add volumes to the group. Select a volume from the drop-down box. Alternatively, you can also create a volume group or add volumes to a group from the Volume tab (see below). Click, hold and drag the left side of the volume up or down to rearrange the volumes in the group. To see multiple volumes layered on top of each other, adjust the opacity of the classes assigned to the volumes (see Opacity). Note: The volumes in the group are automatically displayed in the order that they appear in the group. From the Volume tab, select the volume(s) to group. Hold Shift + left click: to select a range of lines. Hold Ctrl + left click: to select multiple individual lines. Right-click on the selected volumes. select an existing group to add to. 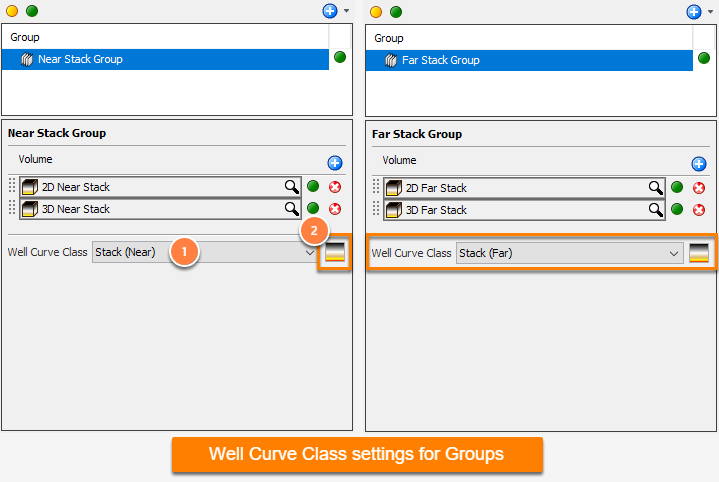 If the Well Curve Class is set, all wells will display a corresponding curve from that class when the group is selected. Click on the adjacent colour box to edit the class. Note: Use the Well Curve Class to automatically select specific well curves when displaying specific volumes. In this example, when the “Near Stack” group is selected, the near stack volumes are displayed along with the “Stack (Near)” synthetic from the wells. 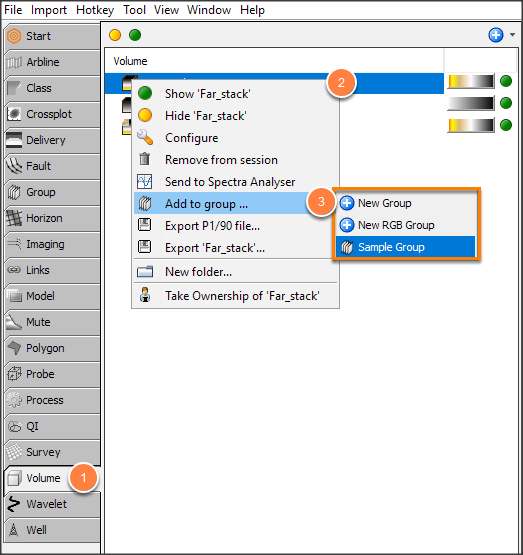 When the “Far Stack” group is selected, the far stacks are displayed along with the “Stack (Far)” well synthetics.